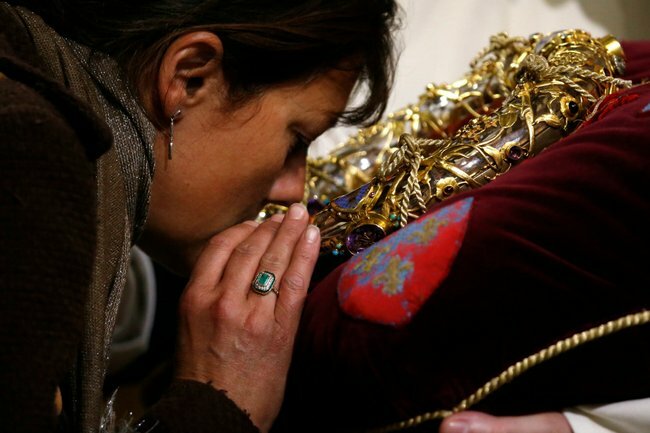 Crown of Thorns Notre Dame and others relics saved during fire. Crown of Thorns Notre Dame: Inside the firefighter operation to save an ancient relic. Notre Dame has been engulfed in flames. Distraught Parisians and stunned tourists gazed in disbelief as a monstrous inferno tore through Notre Dame Cathedral, one of the world’s best-loved monuments, earlier today. There were tears, prayers, and hymns sung in commemoration of the “our Lady of Paris”. And while the people of Paris gathered to mourn the building, firefighters wove together a plan to retrieve one of the most priceless relics inside: Jesus Christ’s Crown of Thorns. According to a translated tweet from the Mayor of Paris, Anne Hidalgo, firefighters formed a human chain to save the works of Notre Dame, including the Crown of Thorns, the Tunic of Saint Louis, and several other precious relics. Father Fournier, the Chaplain of the Paris Firefighters, told reporters he was one of the firefighters who went into the burning cathedral to save the Blessed Sacrament and Crown of Thorns. The Crown of Thorns is a relic of the crown placed on the head of Jesus Christ during the events that led to the crucifixion of Jesus. An instrument of passion, the original crown of thorns was intended to cause him pain and mock his authority. While the authenticity of the Crown of Thorns inside Notre Dame has never been verified, it has been the object of prayer for over sixteen centuries, making it a relic in its own right. The relic consists of a circle of canes bound together and held by gold threads, and is 21cm in diameter. In 1239, the king of France, St Louis, took the Crown of Thorns to Notre Dame with his brother, after buying it off the Venetians. The relic has only able been available for the public to see on the first Friday of every month, and every Friday during Lent. What other relics were inside Notre Dame? According to the cathedral’s rector the fire which was caused by a forest of wooden latticework setting alight has already consumed the iconic spire and the roof. Other relics inside include the 13th century Rose Windows and the medieval great organ. Over 76 paintings that commemorate New Testament’s Act of the Apostles, the crucifixion of St. Peter and the conversion of St. Paul are also inside. “The Visitation” by Jean Jouvenet, which portrays the life of Virgin Mary, was within Notre Dame. Some relics are also historically significant in modern times. For example, the cathedral’s main bell Emanuelle, has marked the end of World War II, as well as holidays and special occasions. But it was inside the cathedral’s treasury that some of the most beloved artefacts lay. Alongside the Crown of Thorns, a fragment of the True Cross and one of the Holy Nails, were inside Notre Dame. The gargoyles on the exterior of the cathedral have also become historically significant. Flames and smoke rose in the sky as the 856 year old cathedral was consumed by an inferno. As firefighters were racing to save priceless artworks, centuries-old gargoyles and the cathedral’s northern tower, world leaders expressed sorrow and grief in messages to the French people.